by Richard M. Bucke, M.D. Wildly arrogant, stunningly bombastic, and undeniably fascinating. This 1901 work-the masterpiece of an eclectic genius whose life encompassed medical science, mystical transcendence, and prospecting for gold-posits a higher form of sentience that only a few humans have ever achieved, among them Jesus, Buddha, Mohammed, Dante, William Blake, and the author himself, of course. 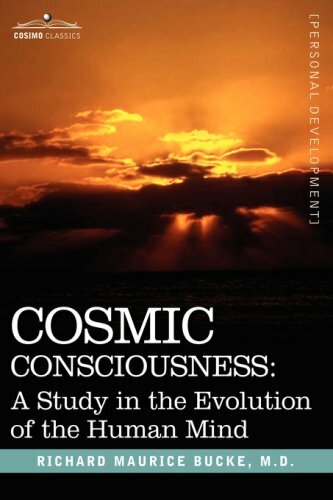 As Bucke shares his metaphysical experience of the "cosmic consciousness" and offers evidence for the few instances in history of its occurrence ("it may as well be frankly stated at once that the view of the present editor is that Francis Bacon wrote the 'Shakespeare' plays and poems"), the reader may well be moved to throw this bizarre and highly intriguing book furiously across the room... if the reader can put it down at all, that is. Canadian mystic and doctor RICHARD MAURICE BUCKE (1837-1902) was a pioneer in the medical treatment of mental illness; his famous friendship with Walt Whitman was the subject of the 1992 movie Beautiful Dreamers. He also wrote Man's Moral Nature (1879) and an 1883 authorized biography of Whitman.